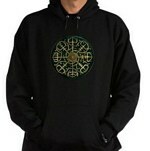 The ancient art of embossing or pressing shapes into metal to create a design. This process has been used for thousands of years. It's almost a lost art nowadays. 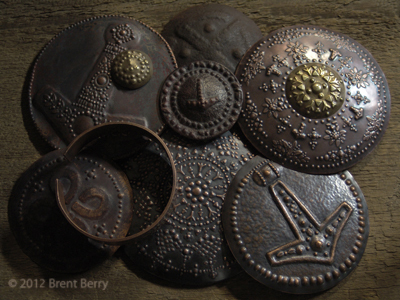 Still, I am only an experimenter at embossing metal compared to some repousse artists. 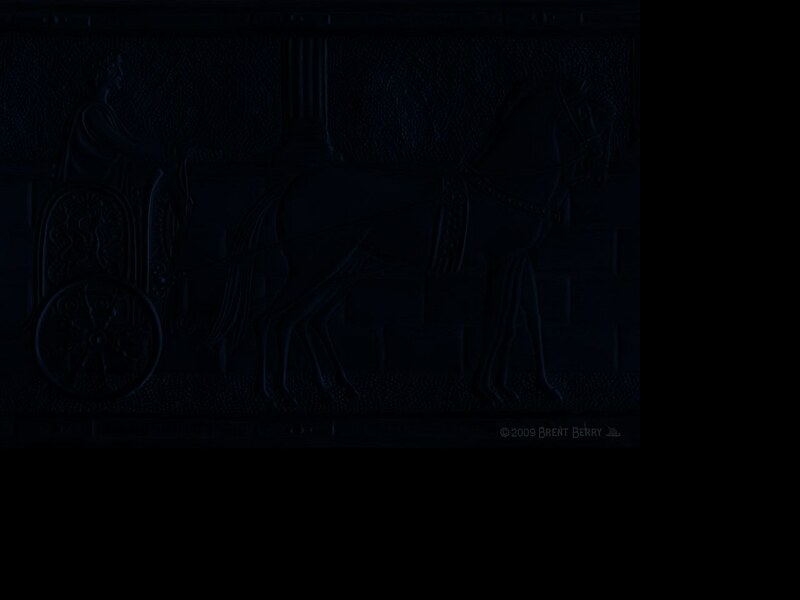 I've always liked ancient art and metal art. I used to work as a metal fabricator for a company that made a large variety of products from metal. I enjoyed the job and learned a lot about working with metal. I had wanted to do repousse for a long time but it was so different and I didn't' know where to start. One day after going to see the Russian Nomads exhibit in Denver, I decided to start experimenting with repousse and soon was making my own. 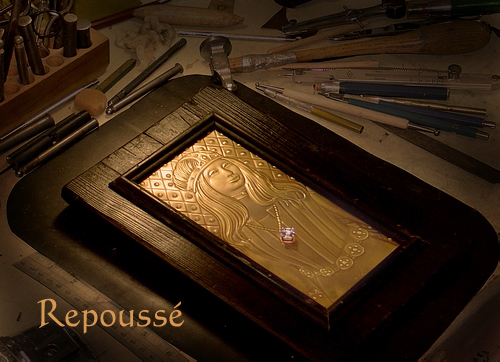 I started doing repousse work in 1990. I start with a thin piece of Brass. I draw the design on with pencil and then use a variety of small tools and a rubber block to add each shape into the metal. Some shapes are hammered in and some are done with hand pressure. The design is worked into the metal from both sides, one bend at a time. If a mistake is made it's usually permanent, the metal is not forgiving! After the tool work, I use volcanic pumice, acids and polish to finish the surface. They take a while to do but its the only way I know of to make them. I don't do them very often but they are rewarding when they come out right. Markings I never put my name directly on my repoussé work, only marks. These are not registered hallmarks, they are simply a way to permanently mark my metal work in a way that doesn't ruin the design. I want many of my works to look like ancient original pieces. I'm proud of my repousse but I think a modern looking name on of this kind of artwork is too distracting. How a piece looks is sometimes more important to me than getting instant recognition. This work is the result of passion. I'm starting to do repoussé again. 2012 - My wrist has been giving me so much trouble that I had about given up on doing anymore hand embossed metal work but now that I've begun to work with thicker metal, my wrist may be able to handle it. I know that sounds strange but when I worked with the thin brass over a rubber mat, I had to use a lot of hand pressure with the tools to shape the metal. Even though the metal was thin, it took a lot of direct hand pressure and that was what was hurting my wrist. Now I am using repoussé pitch, thicker metal, and striking the tools with a hammer instead using hand pressure. So far, my wrist is handling it. I've done very little embossing with pitch so I have much to learn but I'm just happy to be back to manipulating metal again. A few of my first pieces of Copper and Pitch repousse since starting again using thicker metal. They are a bit rough but I like that crude ancient look. The larger disc with Thor's hammer is about 5 inches. I doubt I will ever be able to accomplish the smooth knotwork or detailed results that I did with the thinner metal but hopefully I can improve with time. Thor's Hammer Disc - Hammered Copper $100. Norse / Viking Copper Domed Disc plaque #1 $160. 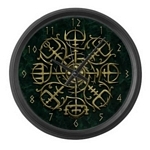 Dimensions of the hammer: 12" X 8"
Dimensions of the plaque: 18" X 14 .5"
Free shipping in USA, $20. for overseas shipping. HEAVY COPPER BRACELET #1 $40. HEAVY COPPER BRACELET #2 $60. 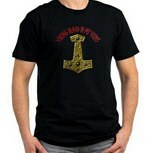 Nordic and Viking T shirts and more available at my Cafepress Store. Since 2013, I haven't done any new repousse work. I thought I could continue but my wrist and back feel worn out. I've been slowing down with many things. I don't want to stop doing metal work but I may have no choice. I have to make things, it's in my blood! In the past I've always done traditional art, things made using physical materials such as paint, paper, canvas, wood, glass, metal, fabric, leather, etc. In recent years I've done a lot of digital art, photo manipulation, etc. I like it but it's not enough. Now I've been experimenting with sound and music. I'm not a musician but know what sounds good to me and I can create through experimentation. It's still experimental but I hope to eventually create something new, original and enjoyable. Links to good sites with info about repoussé etc. Made by a metal chasing, repousse artist for metal chasing, repousse artists. Please ask before you use my images.